Taste test: When I saw the words "kettle cooked" on the bag, I figured these were going to be in the same genre as Cape Cod potato chips. These chips have a lot going for them: they taste very potatoey, they have a nice crunch, and the bag includes many large chips. But I was mistaken in expecting Cape Cod-like chips. 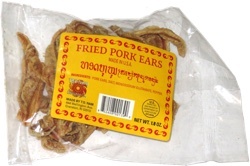 The texture and taste are much different, just not the same sort of crunch or taste, and not as curly, probably because these are cooked in soybean oil. They're sort of like some of the lard-based chips, except not quite so greasy-tasting. Some people liked them a lot, and they're definitely good chips, but overall the Cape Cod chips have a major edge on these. 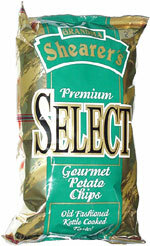 Smell test: Very potatoey, but different — a unique aroma among potato chips.